I’ve never been able to say no to a good fairy tale retelling. They are my absolute weakness, and I’ve been especially tempted as of late by the recent crop of novels touting the point-of-view of the “villain”. 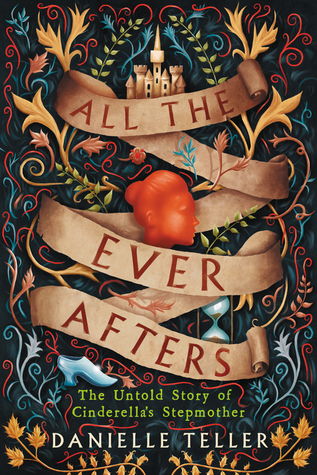 It ultimately led me to pick up All the Ever Afters, which boldly bears the tagline describing itself as the untold story of Cinderella’s stepmother, the notoriously cruel and wicked antagonist from the classic fairy tale we all know and love. However, the author Danielle Teller’s approach to this novel is one that I’ve seldom seen in most fairy tale retellings I’ve read, in that she has completely eschewed all aspects of fantasy and magic, choosing instead to ground her story in history. Opening on the French countryside sometime during the mid-fourteenth or early fifteenth century, the tale introduces readers to Agnes, a young girl born into poverty. Her family could not afford to raise her, so she was sent at the tender age of ten to a nearby lord’s manor to become a laundress’s assistant. Worked to the bone and unfairly treated, Agnes had no choice but to use all her wits and wiles to finagle a better position for herself, eventually managing to escape the manor for a less punishing job at the local abbey. All goes well for several years until Agnes is seduced by the Abbess’s ward and messenger, and their relationship results in a pregnancy. Ejected from the abbey, our protagonist is set up in a village where she becomes the proprietor of a brewery and alehouse, mostly raising her daughters on her own. But soon, tragedy strikes, and Agnes is forced into a situation where she must work her way up from nothing once more. A twist of fate lands her back in the manor where she worked as a child, but the lord is now married with an infant daughter. And thus, Agnes finds herself hired on to be a nursemaid to little Ella, the awkward but radiantly beautiful girl who will one day marry the handsome prince she meets at a fateful ball. Now Agnes and her two daughters live at the palace, where she tells her tale in the hopes of showing how accounts of her wickedness have either been greatly exaggerated or are outright lies. In fact, she was a victim of forced labor herself, and All the Ever Afters is her own rags to riches story. It is a heart-wrenching novel about growing up with nothing to your name, of having to pull yourself up by your own bootstraps to make your own success. While there have been times where she had to use her cunning or resort to deception to get what she wants, Agnes is no villain. And if on occasion she was tough on Ella or punished her too harshly as a child, we learn that it is only because Agnes has been independent and hardworking her whole life, and as a result, she cannot bear idleness or watching her stepdaughter grow up helpless and spoiled. In a way, All the Ever Afters is also the untold story of Cinderella’s stepsisters, called Charlotte and Matilda in this version of the retelling. Like their mother, they aren’t the awful people from the many popular versions of Cinderella either, and they’ve gone through their own share of hard times. Now that I’ve read Teller’s portrayal, I also doubt that I’ll ever think about the “ugly stepsisters” epithet the same way again, not after reading about a mother’s hurt and pain from Agnes’s perspective. As I said before, this is also a purely non-magical story; there will be no fairy godmothers, pumpkin carriages, or singing animals here (though, I was amused to see, the author had managed to work in a tongue-in-cheek jibe at the popular depiction of Cinderella and her affinity for mice, except in this book, Ella’s friendship with her rat Henrietta is nowhere near as adorable…or hygienic). A lot of fairy tale retellings tend to give the mundane things of the world a fantastical twist, but it seems All the Ever Afters set out to do almost the exact opposite, downplaying the magical elements and addressing all that we know about the Cinderella story with realistic explanations. I also found it interesting how the novel mirrored many of the original fairy tale’s lessons—that is, to always work hard and never let setbacks or difficult people get you down. However, while the classic version also taught that beauty is esteemed, but that having a good heart is the most important, things are not so idealized in Agnes’s more realistic world. Her stepdaughter Ella—who is naïve, spoiled, and rather soft and vapid—manages to snag a prince and is loved by all in the kingdom for no other reason because she is beautiful. Meanwhile, Charlotte and Matilda, who have endured so much more, will never have anywhere close to the same opportunities simply because they are homely. Agnes’s lesson for her daughters? Life is not fair, but you still do what you must to keep moving forward. All in all, I enjoyed All the Ever Afters very much. With Cinderella only playing a bit part, this tale truly belongs to her stepmother, who has been given new life by Danielle Teller. In this heartfelt novel, there are no magical spells or fairy godmothers, for Agnes is a woman who relies on nothing but herself to change her life and make a better future for her children. If you prefer fantasy in your fairy tale retellings, you may wish to reconsider this one, but if you don’t mind a narrative that’s more rooted in realism, then I really can’t recommend this highly enough. Audiobook Comments: I was very impressed by Jane Copland’s narration. From her voice, I imagined Agnes to be a proud, sharp-witted and dignified woman, which is exactly the way her character is written. The audiobook experience brought a whole new level of emotion to the story, which I would not have gotten if I had just read the book. A fantastic listen. Haha, you and your Mr. Darcy! This sounds like a unique retelling to say the least. I am curious about that rat. May need to check this one out at some point. Great review! Yeah, it wasn’t near as cute as the mice in the Disney movie! I’ve seen this cover floating around but didn’t really pay much attention to it. I had no idea the story was so intriguing! Seriously that cover makes it look like a light, fluffy YA comedy. It sounds like a much deeper story. Yeah, it was more like a story about her hard life growing up, and the Cinderella fairy tale actually played only a small role. I agree with you they’re my wickness as well so now I’m definitely curious! After reading your review I am both intrigued and fascinated. It is often said that history is written by the winners, and that those that lose the war are often depicted in a bad light, sometimes more than they actually deserve. This seems to be the case, and just looking at the synopsis I feel ready to side with Agnes and her daughters. I don’t doubt this will make for an unforgettable read – thank you so much for sharing! Yes, I love that quote! And exactly, with fairy tales, I always want to know the other side of the story! Hmm, I just checked this out on Goodreads, and it sounds like my type of read! I enjoy retellings rooted more in realism, so I’ll definitely be getting around to this. Great review! Yup! Got this one on my TBR too after seeing it in one of your book hauls, I think. Glad you enjoyed it too because that means I’ll most likely enjoy it as well. The POV of the villain is an interesting perspective that I need to read more of. Nice, crossing my fingers that it’ll work for you too! Sounds really good. I had my eye on this one so glad to read your review.